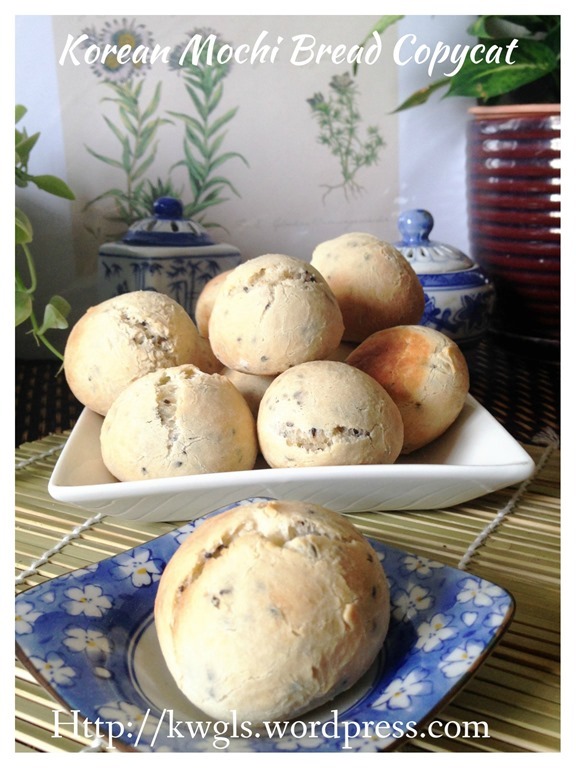 When I issued my Brazilian Cheese Bread recipe yesterday, members of Facebook Group are asking if this is the same as the springy texture Korean Mochi Bread.. 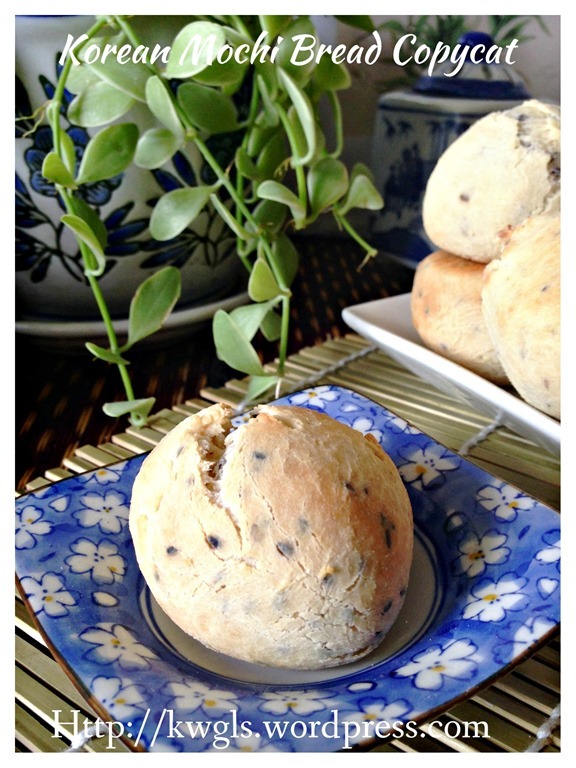 I have heard so much about this Mochi bread and in fact, I have never try the bread before. 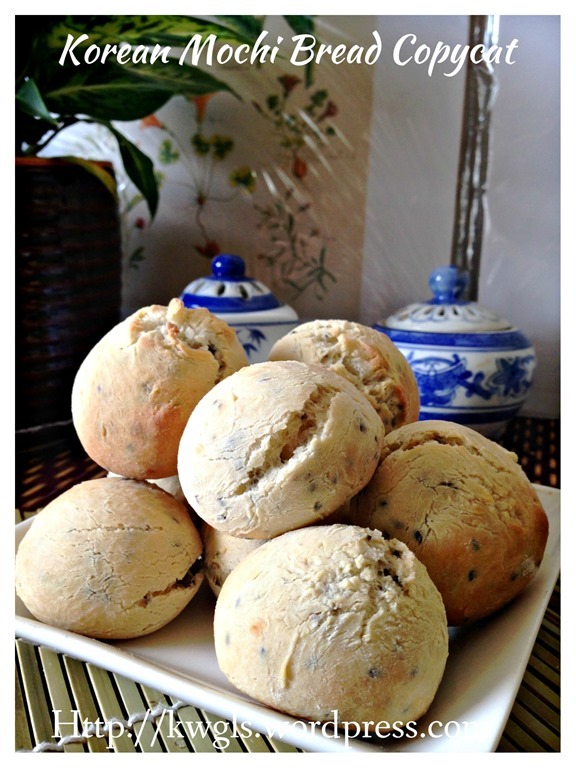 But looking at the pictures in the internet, I knew it is not the same as Brazilian Cheese Bread.. 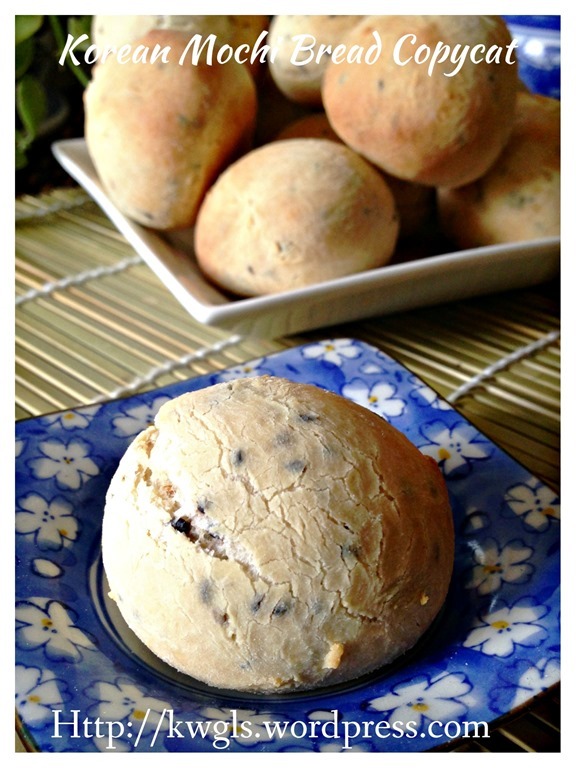 I knew this is a trendy bake and most recipes in the net will need to buy Mochi bread premix.. I am rather doubtful about the need to to buy such premix since it is a Mochi bread literally translated as bread made from glutinous rice flour. Mochi is a Japanese term for sweet rice or glutinous rice. As per Oxford Dictionary, Mochi is a short-grained, sweet, glutinous rice with a high starch content, used in Japanese cooking. (Source: http://www.oxforddictionaries.com/definition/english/mochi). Japanese do have glutinous rice flour called Mochiko flour and Shiratamako flour. On the other hand, Korean also have its version of glutinous rice flour called Chapssalgaru 찹쌀가루. If you looked at this website on Korean cooking ingredients: you will see that all the three types of glutinous rice flour were discussed in the same post. 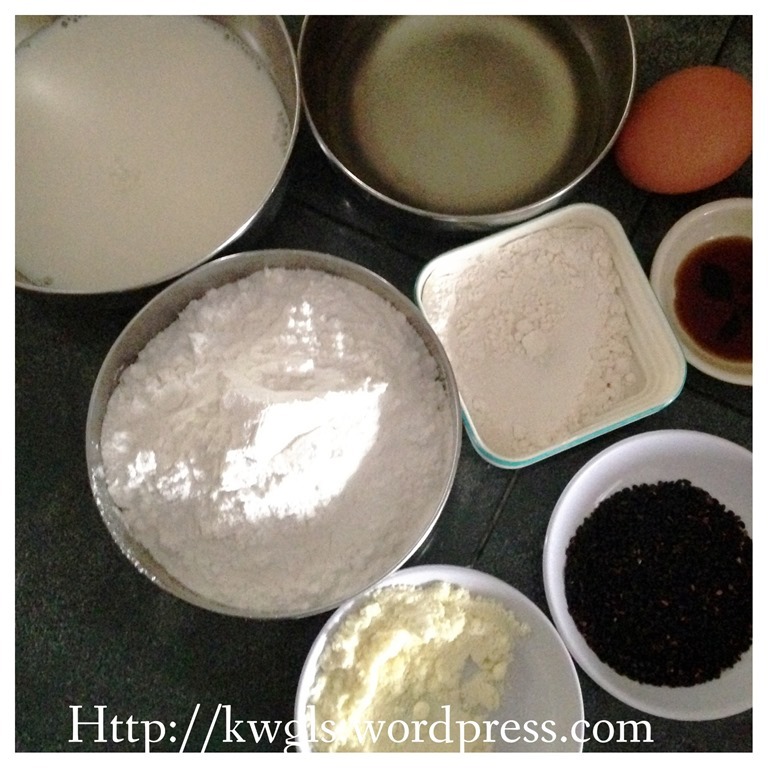 : Sweet rice flour – Chapssalgaru 찹쌀가루 . If Mochiko or Chapssalgaru is equivalent to our glutinous rice flour or sticky rice flour, Asians in general should be very well versed with this ingredient as it had been used in many of our steamed cakes like red tortoise kuih and nonya kuihs. 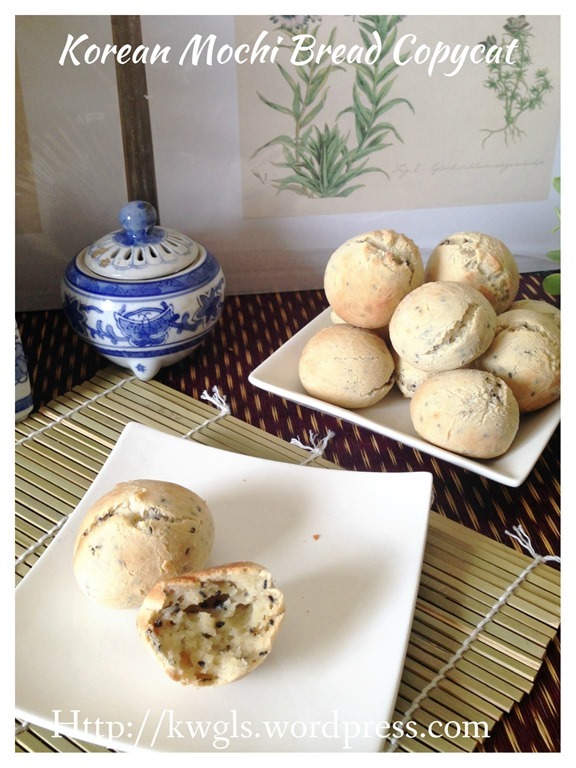 I have found this Korean website that provide 2 homemade Mochi bread recipes, one uses Mochiko flour but another one called for the use of Mochi Bread Premix .. After analysing their ingredients and on the assumption that Mochiko flour is the same as our glutinous flour, I proceed to test the recipe that I summarized from these 2 recipes. I am very happy with the outcome. 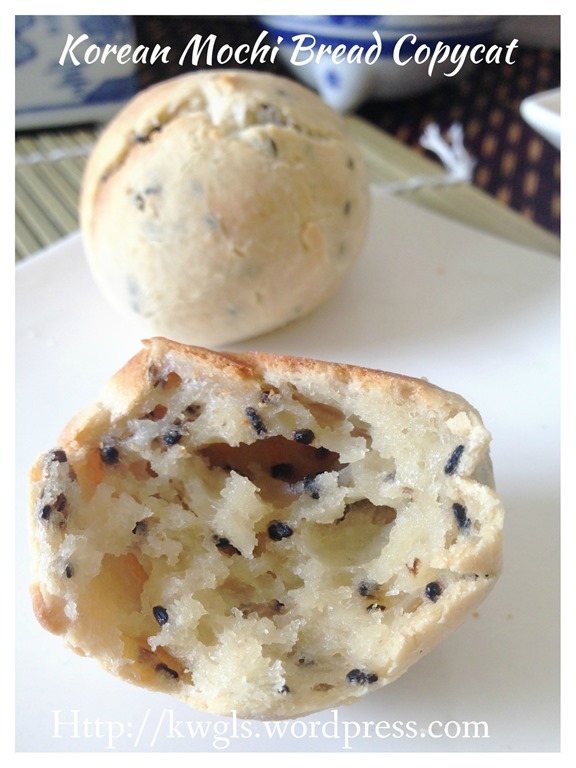 It fits with the description of what most bloggers who used the premix in their preparation have described: Crusty on the outside, chewy in the inside full of black sesame flavour. However, I do not wish to guarantee you that it taste exactly like the premix as I have never taste it before.. I will leave it to readers to decide if this look like those that you have prepared from the pre-mix and give it a chance. 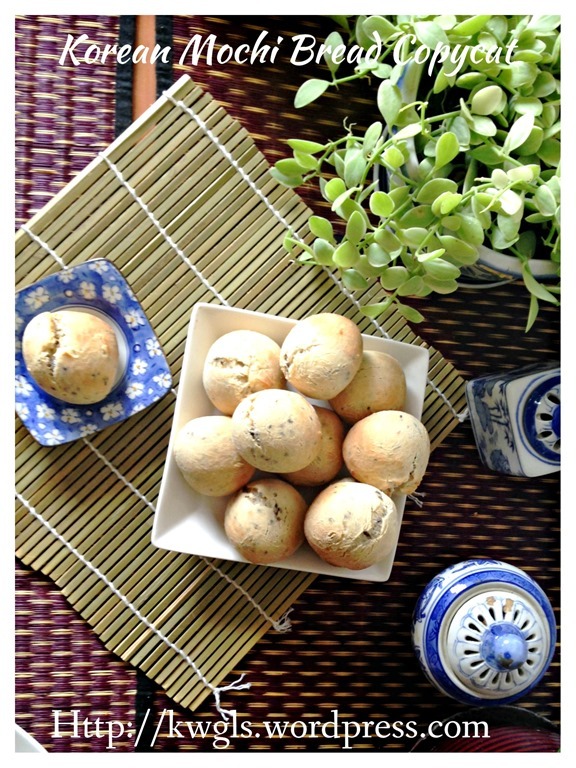 If yes, you will save some money by preparing this from scratch since glutinous rice flour is very economical when compared to the Mochi bread premix. 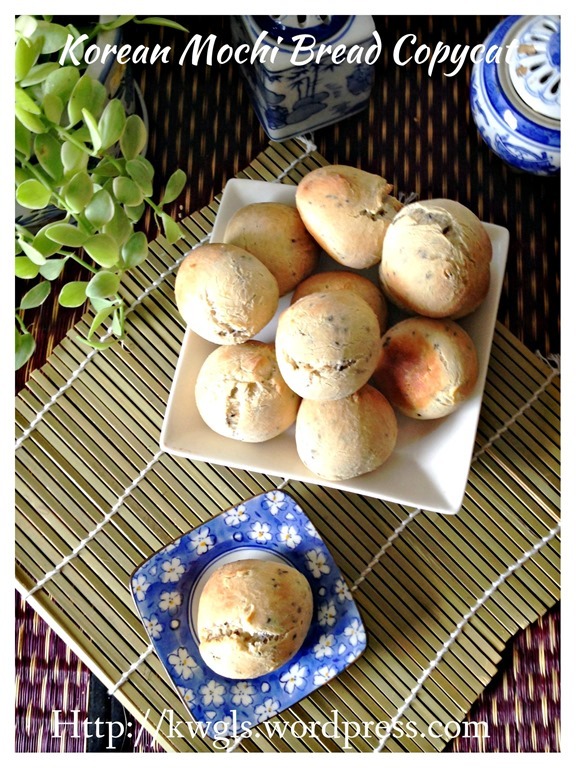 * bread flour make the glutinous rice flour less springy and it is optional if you are looking for gluten free recipes. In a pot, place milk, vegetable oil, light soya sauce and salt. Bring to boil. Once it boils, add in glutinous rice flour, milk powder and bread flour. Off the heat and stir until it form a dough. Don’t worry it looks dry as eggs will be added later. 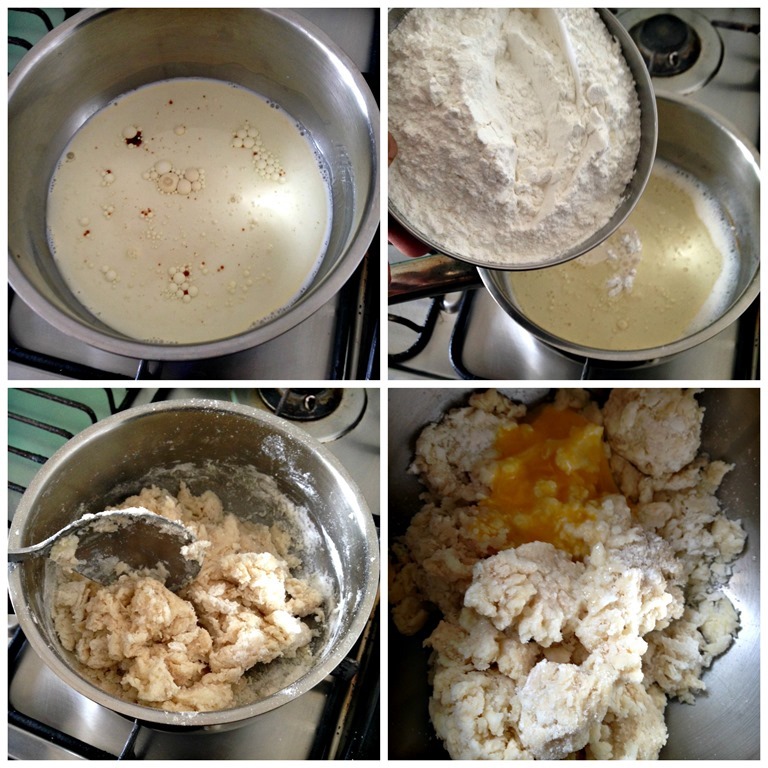 Transfer the crumbly dough to the whisking bowl of a standing mixer and crack the egg. 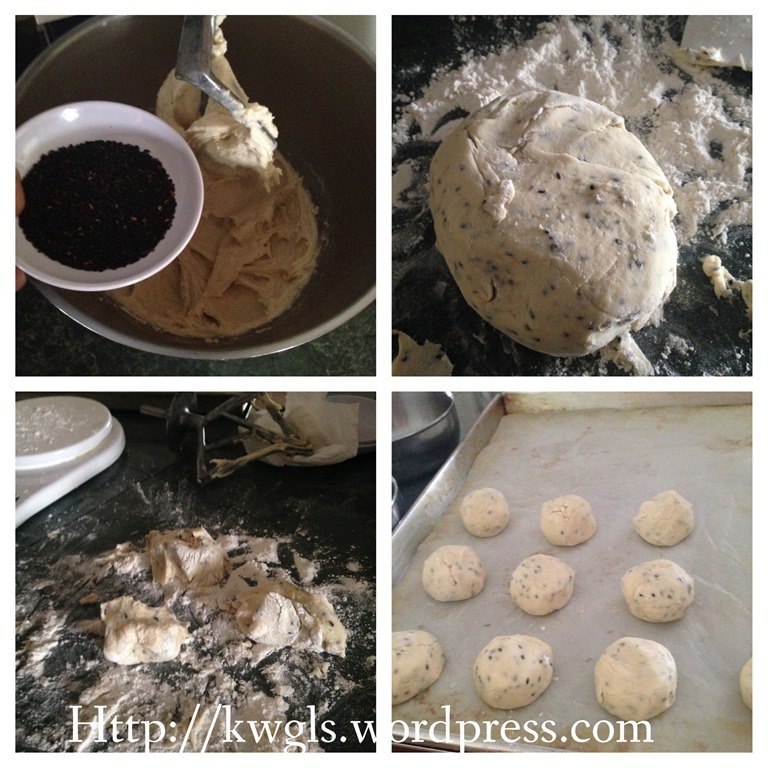 Beat until smooth, add in black sesame seeds and beat until well combined. 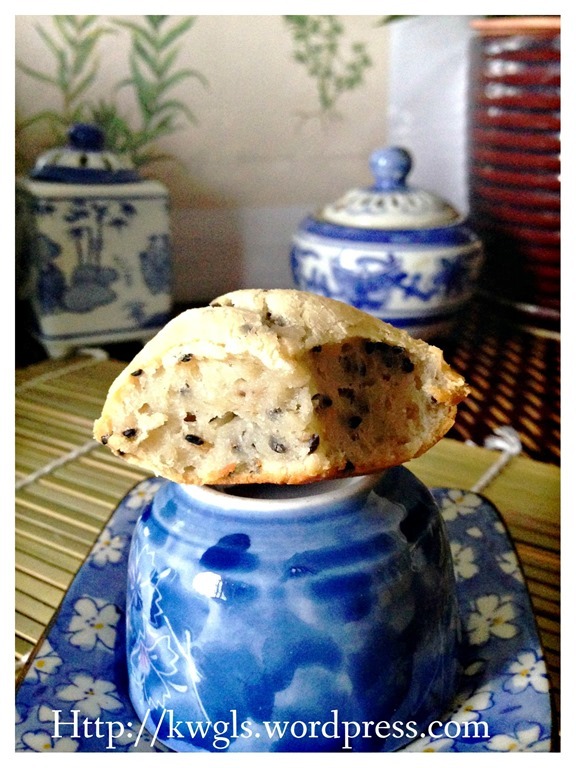 If the dough is overly sticky, add glutinous rice flour tablespoon by tablespoon. Transfer the sticky dough in a work surface flour with glutinous rice flour, divide equally into 12 balls (about 40 grams each), pat your hands with some flour and shape it round. Bake in the pre-heated oven of 180 degree Celsius for 20 minutes or until golden brown. To ensure even colour distribution, turn the tray after 10 minutes interval. If you want the crust to be even more crispy, you can spray some water mist on the buns before sending in to the oven. Best served warm as a snack. 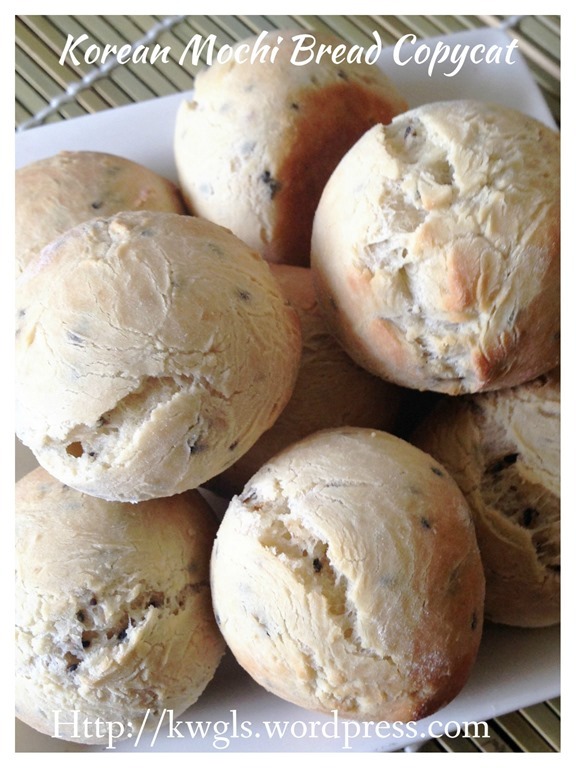 Another gluten free “bread” (if you omitted the 20 grams bread flour) for readers to try out. Frankly speaking, I like the bread for its crispy crust, springy interior texture and simple sesame taste.. It is definitely a good snack for one to munch on.. 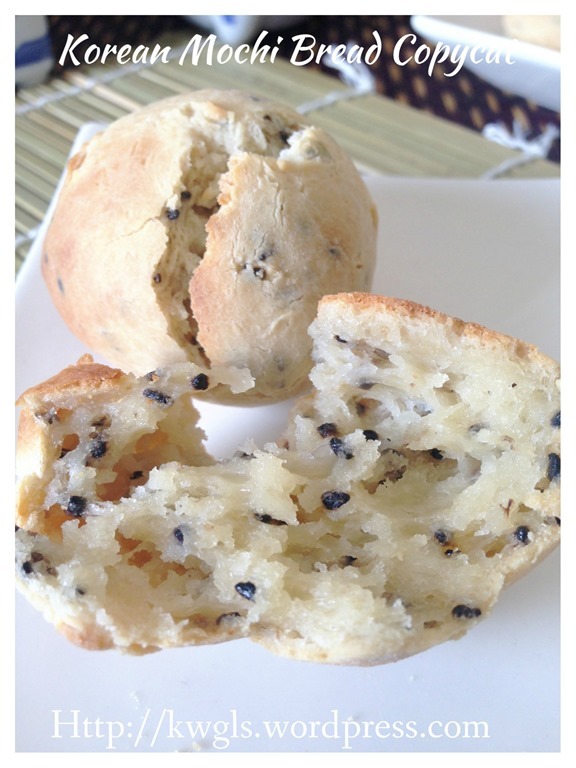 This entry was posted in Breads and Pizza, Food Preparation Series, Snacks and tagged 8, black sesame bread, 韩国黑芝麻麻糬面包, 麻糬面包, GUAI SHU SHU, Guaishushu, kenneth goh, Korean Black Sesame Mochi Bread, mochi bread, postaday. Bookmark the permalink. So am I correct in presuming that I can also make the flour by just grinding up short grain aka pudding rice? I can actually get something called ‘semoule de riz blanche’ here in France but I am not sure it would be the same – as it is translated more as ground rice than flour – I use it for shortbread biscuits. 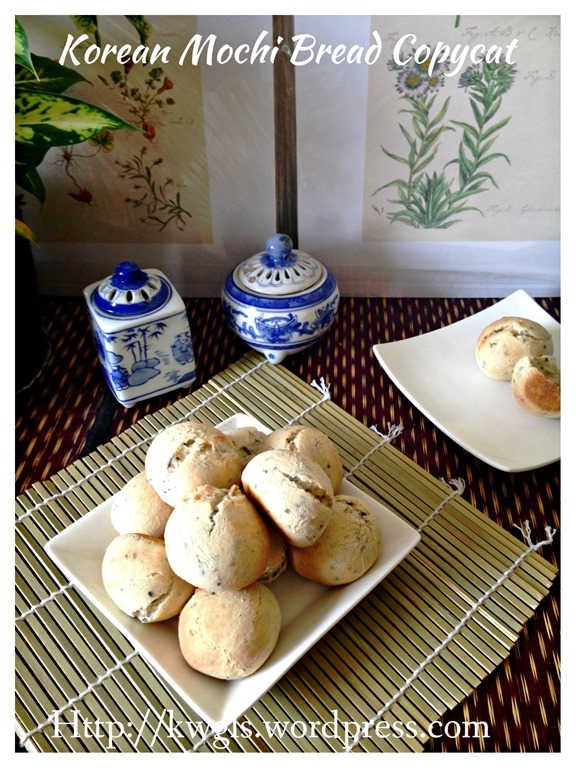 This looks a really interesting recipe and we have a relative who stays with us every year, she is gluten intolerant – so we are always looking for new ideas! I am unsure if this is the same but glutinous rice flour is translated as “farine de riz gluant” in France. May be you can look for that. Thanks for dropping by. Thanks for this. I’ve been looking for a recipe to make these from scratch. How do the grams translate into cups/tbsp? I’m using U.S. measurements. Hi! I tried your recipe yesterday, but with chocolate rice instead of sesame. The taste is great! However I find that the bread was rather tough and dry on the inside, instead of soft and chewy. The outside is also hard… that my 2-year old can’t bite through. Haha… Anything that I could have done wrong? I did find myself having to add a lot of glutinous rice flour on top of your instructions, and I used my hand to knead the dough as I used a hand mixer and it was not doing a good job. Thanks in advanced! Chances are overbaked… as too much water vapour was lost.. sorry to hear that. I didn’t have a stand mixer, only a hand mixer. Is it possible to use that? I believed it can be done..
Can this be made into a loaf instead of rolls? Also, what if you do not have a stand mixer? I would advise not. Baking a loaf of glutinous rice dough may take a long time.. 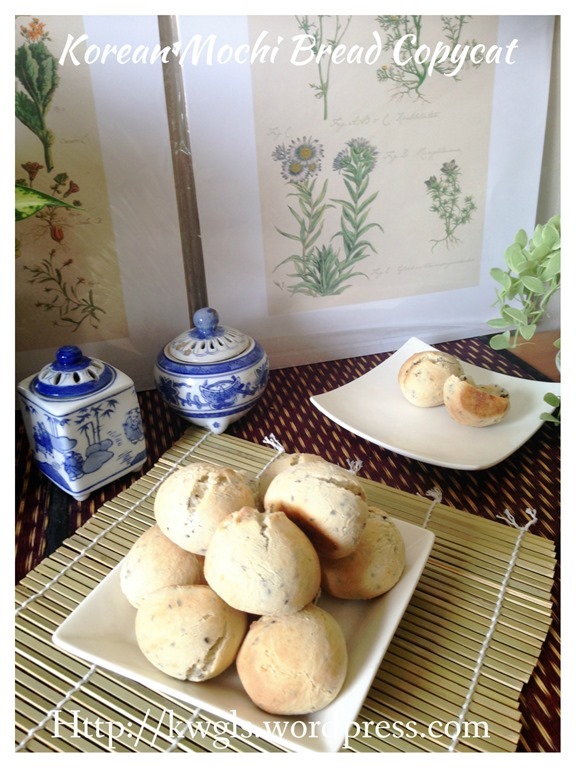 Awesome, I have tried making it last year, failed many times, I also have read some articles talking about Brazilian buns are like Mochi Buns, but by that time I was so discouraged, now I finally found your recipe that making from scratch, hooray! Thank you so much of your sharing! Gamxia. Hi mr goh, mabuhay!. . Just want to ask the difference between tapioca flour and glutinous flour? Or can i also use tapioca flour? Thanks. Hi, I tried making this but it never turned out like bread. The mochi on the inside ended up coming out as the outer part never grew. Should I add extra bread flour? What do you suggest me doing?